Over the past several decades, increasing maternal labor force participation and growing public recognition of the importance of early education for children’s development and school readiness have led to a large and steady increase in young children’s participation in early care and education programs. Whereas in 1964 only 9.5 percent of three- and four-year-olds were enrolled in school, by 2011 that figure had grown to 52.4 percent (Snyder and Dillow, 2012). There has been a contemporaneous growth in public investment in early childhood programs over the past few decades, including both federal programs (e.g., Head Start and child care subsidies) and state investments (e.g., state prekindergarten). What types of non-parental early care and education (ECE) arrangements were children enrolled in between 1995 and 2011, and how did enrollment patterns change over that period? What are the trends in the use of center and non-center ECE? What are the trends in the use of private ECE (with a family payment) and public ECE (without a family payment)? What are the trends in the use of full-time and part-time preschool for three- and four-year-old children? 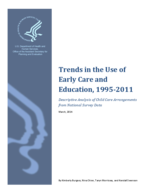 From 1995 to 2005, there was remarkably little change in the overall use of non-parental early care and education (ECE), but there was a significant shift in the types of care children attended: children’s enrollment in center-based ECE increased and enrollment in non-center care decreased. This shift occurred for all ages between birth and five years, but was most pronounced among children under age three. Additionally, among children ages three and four, the CPS data show that rates of enrollment in public preschool increased and private enrollment decreased from 1995 to 2011. Among children under three, however, the NHES data show that the rate of enrollment in centers with a family payment (i.e., private centers) increased while enrollment rates in centers without a family payment (i.e., public centers) did not change. Rates of participation in full-day and part-day ECE among three- and four-year-olds changed very little during this period.